New Years Resolution...Friend or Foe? Check Up! Are You Ready To Take On a New Challenge? New Workshop: "Making Timely Choices." As you open up this months issue youre probably saying, Oh no, not another article on how to keep new years resolutions! ? Well...yes, uh-huh, yep, thats what it is, another article on how to keep New Years resolutions. Heres the twist, dont make them if youre going to break them. Stop torturing yourself! Who came up with the bright idea of making resolutions at the beginning of each year? According to some, the tradition dates back to 153 B.C. when the Romans put Janus, the god of beginnings and the guardian of doors and entrances, at the head of the calendar; hence our month of January. Janus had two faces and could look to the future and to the past simultaneously. Overtime he became the ancient symbol for resolutions. As the new year approaches, we are doing just that...looking back at all that has happened, and looking forward to what there is yet to be. The new year can feel like opening a brand new journal, nothing is written on the pages. The paper is crisp, pristine, begging you to put pen to paper. And here we are, just coming off a very joyous, hectic, high activity season. Our bodies and our minds are eager for some down time. We may be thinking of things we wish we could have handled differently. And here is this wonderful new year begging us to tell it what we want to do, what we want our life to be like. How can we not make resolutions? So, if youre going to make them, they should at least be SMART: simple, measurable, attainable, reasonable, and timely. Im going to enhance my life experiences by strengthening my personal foundation, developing emotionally healthy relationships, ridding my life of tolerations, and propelling my career to new heights. Who could understand all of that, let alone remember it and implement it! Resolutions like, I want to be consistent in disciplining my children, I want to spark more romance to my marriage, I want to complete the projects I begin this year...these are simple, understandable, easily remembered. What fun is it to have a resolution when you cant tell if youve attained it? You want to be a better parent. Fine. Now what will tell you that you are a better parent? Your children obey first time, every time? You always have their lunches ready and waiting at the door as they leave for the school bus? You read bedtime stories to them every night? Their teachers stop sending home notes about their homework not being complete? Are these really going to tell you that youve been a better parent? A more measurable resolution would be, I will read bedtime stories to my children at least 5 nights every week. Or, I will not raise my voice when disciplining my children. I will discipline my children when I feel they need it, and not put it off because its inconvenient. I will quit smoking. I will lose weight. I will save $X amount of money. Simple, measurable, but are they attainable for YOU? How can you quit smoking if you dont have a plan you can stick with? How can you lose weight if you dont know what has been keeping you from losing it in the past? Setting up a resolution without a workable plan, without understanding why you may have failed in the past, or without having overcome your past barriers to success...this is setting yourself up for failure. If you overeat when you are unhappy, or under pressure, AND you are now able to deal with those situations in a healthier way, you are now in a position to take on a weight loss program. If your 78 year old father has just had hip surgery and youre going to spend a month caring for him as he recovers, is this the time to promise yourself that you are going to spend more time with your friends? Is this the time to promise youre 12 year old that youre going to help him build a model schooner? 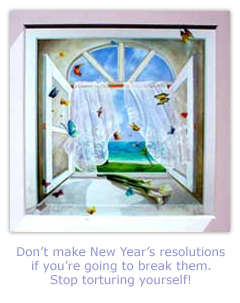 In setting our resolutions we must be honest with ourselves, accepting the limitations that are before us. Its okay to raise the bar to encourage us to be the best we can be. But its not okay to expect that we will be all things to all people, do what we have never been able to do before, and do it all excellently by just writing it down as a new years resolution. Its a lot more fun to achieve a goal that is within our reach, and to stretch a little farther the next time; than it is to stretch ourselves so thin that we snap. Your resolutions should be set before you need them to be complete, but no so far in advance that you lose the motivation or need to complete them. For example, promising a start a college fund that will cover 4 years of tuition, when youre child is in the 10th grade isnt exactly the timeliest of resolutions. A better one might be to promise to sit down with a financial advisor and your spouse, by the end of January, to discuss what options there are for generating funds to cover the tuition. And at the other end of the spectrum, promising to complete a quilt for your daughters wedding, when she isnt even dating yet, can result in your losing the motivation and thus failing to finish the quilt. When we set resolutions that are SMART we are almost assured success. So, like Janus, look back to learn from your experiences, and look forward for hope and inspiration; then set a goal that you will enjoy working towards. Have a fun and fulfilling New Year! Heres the truth that we discover when we decide to stop telling ourselves fairytales about the problems that occur in our lives. Despite what we have conned ourselves into believing, the majority of our problems are optional. Most of our existing problems dont just happen, arent randomly selective of us and tend to be reoccurring. The difference between a problem that selects us and a problem that we select to have is that the problems that select us can usually be classified under the heading of an act of God. Problems that fall under such a heading would be; wind storms of all kinds, snow storms, floods, power outages and accidents, illnesses that occur in spite of the fact that we have done everything possible to take good and diligent care of our health. Nearly all of the problems we have do not fall under the heading of an act of God. 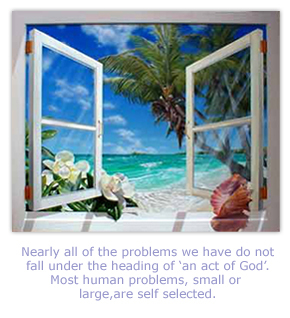 Most human problems, small or large, are self selected. You are selecting to have a problem when you notice the little red light on your dash board blinking but you choose to ignore or postpone taking the car into the shop and getting it checked out, tuned up or given an oil change. You may act as surprised and upset as you choose when your car stalls out on the highway in rush hour traffic. You can list all the excuses that you like for not having dealt with the car issue while it was merely an inconvenience, but it wont change the fact that now you have a problem. We regularly create problems for ourselves in every aspect of our lives. In our relationships, our businesses or work, with our cars, computers and even that rising laundry pile that hides in the closet until we run out of clean clothes to wear or Aunt Edna comes to visit. If we postpone balancing our checkbooks because we are too tired or just dont feel like doing it and we have inadvertently made a calculation error, when checks begin doing the bouncing Tigger dance, we know inside of us that we could have saved ourselves the now costly problem. While we are spending beyond our means, we know that inevitably the bill will come due and that we are selecting a future stress problem for ourselves. When we have a twinge of occasional discomfort in our left, lower molar but we ignore it until we wake up and the entire left side of our face is swollen, deep down we know we could have saved ourselves a very painful problem. We are aware that when we repeatedly postpone the nurturing of our most vital relationships that eventually problems of resentment or even estrangement will arise. We allow little challenges and inconveniences to grow into upsetting and unnecessary problems everyday. Then, in order to escape the problems we've created, we consider making huge changes in our lives. Perhaps a career change, new friends, a move to a different state, the purchase of a new home or car or even a new spouse. We all want to improve ourselves and change our lives for the better but facts are that most improvements require that we successfully meet bigger challenges than the ones we currently have. The first step in preparing ourselves to take on new goals and the bigger challenges that will undoubtedly come with them is to make certain that we can proficiently deal with the challenges we have now. We need to be certain that we are able do so consistently and before all our current, inconvenient, little challenges have the opportunity to grow up to be big problems. Are you ready to take that first step toward becoming virtually problem free and therefore prepared for bigger challenges and opportunities in your life? Make a solemn vow to adhere to this old but tried and true adage. Read a time management book or take a class if necessary. Once you have caught up, try to get ahead of everything on your plate. 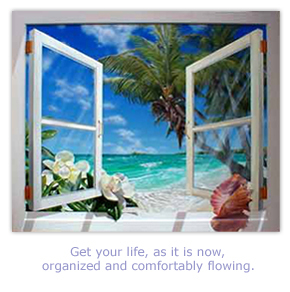 Get your life, as it is now, organized and comfortably flowing. Form a routine for taking care of all the things and people that are currently in your life. Think,  quality maintenance of your current life and lifestyle. Think, quality time and care of all the people in your life. Most importantly, include yourself in the list of people that you will provide quality time and care for. Wait a few months and monitor yourself, your loved ones and your possessions. Hows everything going with your cars, computer, job or career, home, family, friends? Uh-oh, dont forget about that to do list you hid in the back of your desk drawer? If you havent bounced any checks lately, your computer isnt still showing the same pesky error message it was showing three months ago whenever you opened Outlook, and your car isnt waiting on the highway for a tow truck, youre almost ready. If there are no little warning lights blinking anywhere or on anything, if you and your family, friends and pets alike are all still alive, doing well, and on comfortable speaking terms then youre ready to take on an additional goal and all it's challenges. You are prepared to succeed. Just 2 nights ago my partner and I were watching a cricket game from Zimbabwe on cable. The team that was currently batting was leading by a huge margin in the 1st innings but during the 2nd innings were dropping out like flies. They were struggling to maintain their score and beat their opponents. My partner looked at me and said in disgust "What are they doing, trying to lose?" I looked over at him and thought to myself, "Wow! You're so right". In an instant he had clinched many of our problems from a simple game, while several of us struggle to reach the pinnacle and fall short of our dreams. Isn't it amazing that sometimes no matter how hard we try, it seems that we're always trying to lose instead of striving to win? It's like reaching a weight loss plateau and having no idea how we're going to get rid of those last 5 lbs. I'm sure you've experienced this or know someone who has, for example, can't seem to earn more than a certain amount of money, who can't seem to lose more than a certain amount of weight, who can't seem to pass an important exam no matter how many times they've taken it. We're trying to succeed and do the best we can but something is holding us back. Are we afraid of something? My friends allow me let you into a little secret about ourselves, if it's okay with you. Our minds are so conditioned to understand, accept and appreciate only what we know. It knows that we earn a certain amount each year and no more. It knows that we can lose a certain amount of weight and no more. It knows that we can attain a certain level of success and prosperity and no more. When that point is reached, unconsciously we tend to sabotage our early success and stop ourselves in our tracks from achieving more. This is Internal Resistance. It's these Resistance thoughts that stop you from doing what you want and can often show up as procrastination. Before and up to that point of resistance we begin to have thoughts such as: "I can't do this". "I'm not going to earn any more than this no matter how hard I work". "This will never happen". "I'm not yet ready for this". That is not to say that we don't want or desire more. On the contrary we do! So, what are we going to do about getting everything that we desire? How are we going to attract more than we're programmed to? We need to re-condition our minds to accept more prosperity and more abundance and therefore open ourselves up to receiving more than we're accustomed to. Sounds complicated? Don't worry it's not. This can readily be done by accepting that your life CAN be as fulfilling, as rich and as prosperous as you desire. Realizing that you can have whatever you desire. Purchase a journal. We'll call it your Prosperity Journal. Each day before bedtime, start appreciating the good things that occurs in your life. Doing this will open your whole being to attracting more. Be grateful for all things that you do, that happens to you and that exist every day-both large and small. 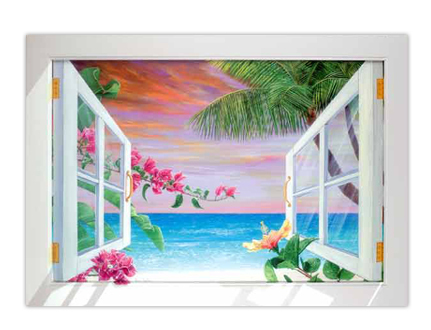 It could be the sunshine or the rain, your family, your job, your business. As you begin to focus on being grateful, more of the same good shows up in your life. As more begins to show up in your life, you understand that you can focus on what you want and attract it. As you begin to focus on what you want, that as well will show up with much less resistance and struggle on your part. As you expand your mind you expand your possibilities. You will come to understand that everything is available to you in absolute abundance. It is only for you to allow it to come into your life without resisting. You will come to understand that the Universe is limitless and full of abundance and that instead of trying to lose, you will master the process of winning! To help men and women who are trying to be all things to all people, and falling a little short...in their own eyes...Ive developed the Making Timely Choices workshop. The workshop is in a group coaching format and takes place over the phone...helping ease the stress of fitting in not only time for the workshop but also time for getting there and back. 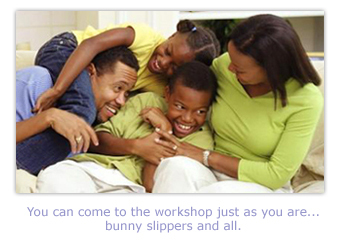 And you can come to the workshop just as you are...bunny slippers and all. In case youre unfamiliar with group coaching, it can be defined as coaching that takes place with two or more people simultaneously. A benefit of group coaching (vs. one-on-one coaching) is the synergy thats created which often produces outcomes greater than what each individual might produce. As your coach, I will at times deliver specific information or resources which I believe will be of benefit to everyone in the group. This might be a short (e.g., 5 minute) talk on a particular topic. Most often, I will encourage the group to bring issues to the table that we can discuss. We will meet for 4 one-hour sessions. Between sessions I will be available by e-mail or by phone (for short 5 minute calls), whenever you need me. I will also meet with each participant once for a 45 minute one-on-one session to discuss issues specific to that person. The workshop fee varies based on the number of participants, so encourage your friends to join you. If youre interested, click on the link below to send me an e-mail. Please put Group Coaching Workshop in the subject line. Remember, you CAN have the life you want. 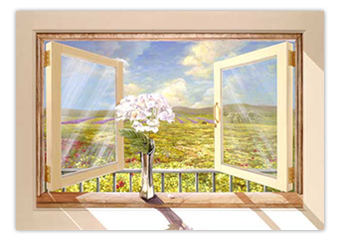 Do you love the paintings youve seen in this newsletter? These paintings were done by a wonderful artist, Lynn Fecteau. To visit her gallery and purchase her work (originals, giclees, lithographs, and posters) go to her website: www.lynnfecteau.com. Another artist whose work I love is Diane Romanello. Youll see some of her work on other pages of my website. To visit her gallery and purchase her work go to her website: www.dianeromanello.com. 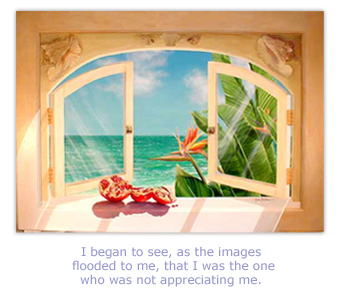 My thanks to Lynn and Diane for allowing me to use their art on my website. Dr. Emerson & Sarah Eggerichs, Love and Respect Ministries, Inc.
Changing Your Childs Heart, Parenting Tools To Change Your Childs Attitude, Not Just Behavior Steve Sherbondy, Tyndale House Publishers, Inc. Compiled & edited by Bill & Diana Waring, Emerald Books.